Wonderfully fragrant flowers of Sweet Violet plant, Viola odorata, are much used in perfumery and cosmetics. Violet flowers are used to flavour candies and drinks and used as a garnish. European folk use of the root as a remedy for bronchitis. A cough syrup can be made by gently heating the flowers in honey. Flowers also used in pot pouri. 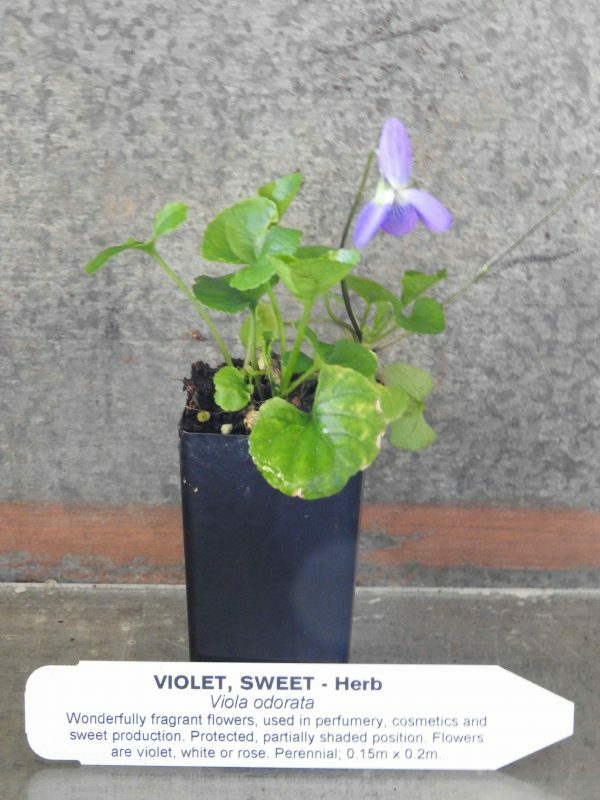 Sweet Violet plant is a native of Europe and prefers well composted, moist soils in a protected partially shaded position. The flowers are violet, white or rose appearing in spring. Frost resistant but drought tender. A perennial plant, growing to 0.15m x 0.2m. Be the first to review “Violet, Sweet plant” Click here to cancel reply.